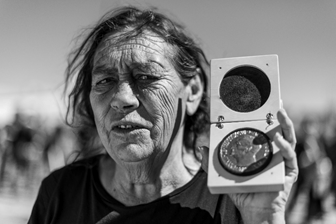 Aunty Sue Coleman-Haseldine with the International Campaign to Abolish Nuclear Weapons’ 2017 Nobel Peace Prize, Canberra, September 2018. Photo: Martin Ollman. Australian prisoners of war and occupation forces in Japan were exposed to the effects of the atomic bombings. The UK government carried out 12 atmospheric nuclear weapon tests on Australian territories from 1952 to 1957. Further radiological and toxic experiments continued until 1963. The nuclear weapons tests displaced Aboriginal communities, contaminated land and had long-lasting impacts on the health of veterans, civilians and the environment. Australia was also affected by fallout from French Pacific nuclear weapons tests. Interwoven with this complex history are highly contested nuclear projects including uranium mining and proposals for nuclear waste disposal. The 2017 Treaty on the Prohibition of Nuclear Weapons obligates assistance to victims and remediation of contaminated environments. Despite significant pressure from Australian civil society, Australia boycotted the negotiations. To honor nuclear weapons survivors throughout the Pacific and beyond, Australia should sign and ratify the Treaty. 16,000 Australian personnel risked exposure to radiation from the atomic bombings in Japan, as POWs and occupation forces. 16,000 military and civilian Australians took part in the 12 atmospheric British nuclear weapons tests between 1952-1963 on Australian territories. The British nuclear weapons tests left a legacy of environmental contamination. There were an additional 600 British ‘minor trials’ – subcritical tests – that spread radiological and toxic contamination across the South Australia desert. Many veterans of the tests and Japanese occupation have health problems consistent with exposure to radiation; descendants also report multi-generational health problems. Mining of uranium and storage of nuclear waste poses humanitarian and environmental hazards, especially to Indigenous communities in Australia. Australia was exposed to fallout from French Pacific nuclear testing from 1966 to 1974. Venting and leaching of radioactive materials from France’s underground test sites into the ocean poses environmental risks to the South Pacific region. Assess and RESPOND to the humanitarian needs of survivors, including nuclear veterans, Aboriginal and other communities affected by nuclear weapons use and testing. Survey and REMEDIATE contaminated environments in the testing grounds surrounding the Monte Bello islands, Emu Fields and Maralinga. RESPECT, protect and fulfill the human rights of nuclear veterans and test survivors. * Aboriginal and Torres Strait Islander people should be aware that this paper contains images and/or names of deceased persons in photographs or stories.